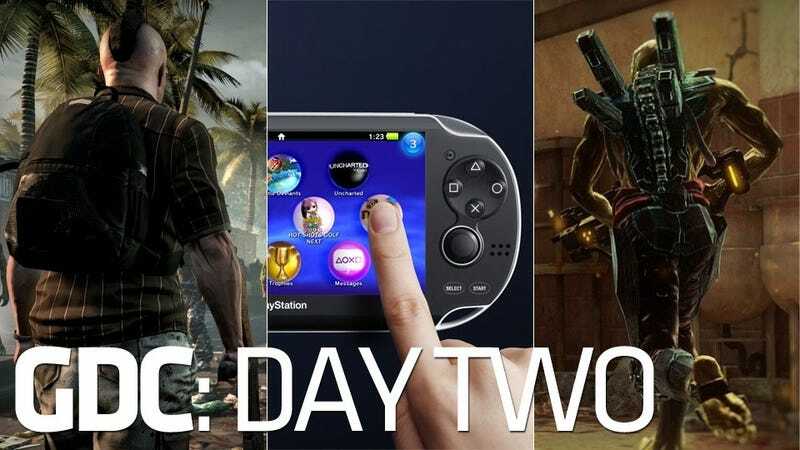 Kotaku's reporting team is in its second day of news-wrangling at the 2011 Game Developers Conference, bringing back details, screens, footage and anything else bubbling up at one of the industry's leading conferences. The conference is scheduled to last through tomorrow, but that won't be the end of news coming back from San Francisco, For now, here's a roundup of the past 24 hours at the conference. Dead Island is a heavily (and long-) anticipated game getting its first big closeup at GDC. Brian Crecente offers detailed eyes-on impressions of the game from a showing of it this morning. "It is everything good about zombie games, a shambling stitch-work of the best bits of a decade's worth of undead gaming and fiction." One of the more offbeat exhibitions of technology is Puzzlebox Jigsaw, a neurometrics device that monitors how focused or distracted, how fatigued or alert a gamer is during a game, and other characteristics. Crecente slipped on a headset and gave it a try with Call of Duty: Black Ops. Resistance 3 takes to the American heartland, centering around a man's fight to protect his family. "His battle, and it seems the game, is a much more personal affair," Crecente writes. Sony downplayed the computing power of the NGP, the successor to the PSP, despite rumors that it would be as powerful as a PlayStation 3. Engineers told Michael McWhertor that the device "instead sits about ‘halfway' between the original PSP and PS3." Game developers say the darnedest things when surrounded by thousands of their compatriots and the unwashed gaming press. Here are some of the rumblings we've overheard during this year's show. Dead Island's developer swatted rumors that movie rights to the game have been bought up, but said a deal is in the works. Valve, experimenting with biofeedback, developed a version of Portal 2 in which players aim with their eyeballs. The creator of landmark adventure game Out of This World once got into a fight with the game's publisher, Interplay, sending them something known as "the Infinite Fax." Hey, it was the early 1990s. The creator of Heavy Rain exhorted his colleagues to make more grown-up video games. "Make games for adults," he said. "Seriously. It's going to change your life." The Game Developers Choice Awards and the Independent Game Festival both honored the best games of 2010. Full lists of winners at the links. Watch this space for more updates from the show and beyond as Kotaku continues its ongoing coverage of the 2011 Game Developers Conference.